Alex Galchenyuk, a top prospect for the 2012 Entry Draft, headlines a talented group of American players chosen for the U.S. Under-18 Select Team that will compete at the 2011 Ivan Hlinka Memorial Tournament from next month. Galchenyuk's father, Alexander, is from Belarus, but Alex was born in Milwaukee when his father played for the Milwaukee Admirals of the International Hockey League. 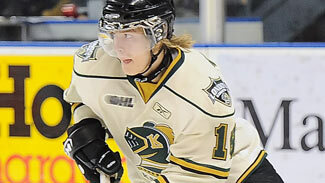 Alex, a 6-foot, 185-pound center/left wing, was taken by the Sarnia Sting with the first pick of the 2010 Ontario Hockey League draft, and finished second among all first-year OHL players in scoring last season with 83 points in 68 games. Eight players from Sweden's entry at the 2011 World Junior Championship are part of the 23-man group that will take the first steps in making the team for the 2012 tournament during a junior evaluation camp in Lake Placid, N.Y. The camp, which runs Aug. 6-13, will feature exhibition games against prospects competing for WJC spots from the United States and Finland. Among the returning players for Sweden from last year's fourth-place team is a pair of top-five picks in last month's Entry Draft -- left wing Gabriel Landeskog and defenseman Adam Larsson. It wasn't by accident that the Tampa Bay Lightning scored a natural hat trick on Russian-born players chosen at the 2011 Entry Draft. What was a tad surprising to Tampa Bay Director of Amateur Scouting Al Murray was the fact the organization snared three of the top Russian prospects at their position with their opening three picks, spanning five rounds. Only eight Russians were drafted last month, meaning Tampa Bay cornered 37 percent of the Russian market at the draft. The club's first-round choice (No. 27), center Vladislav Namestnikov of the Ontario Hockey League's London Knights, is the only one of the group scheduled to participate in Tampa Bay's summer development camp, which runs through July 13 at the Brandon Ice Sports Forum in Brandon, Fla.
Before the 2011 Entry Draft took place, the initial phase in sorting the top prospects for 2012 already was in motion as the scouts organized NHL Central Scouting's preliminary Futures List of North American and international players. Among the 'A List' players in North America -- those considered to be potential high draft picks next June -- nine were from the Ontario Hockey League, eight each from the Western Hockey League and the Quebec Major Junior Hockey League, and five were starring in the United States Hockey League. The list was released to teams May 30. Heading the field were standout defensemen from the WHL, including Mathew Dumba (5-foot-11, 171 pounds) of the Red Deer Rebels, Ryan Murray (6-0, 182) of the Everett Silvertips, Derrick Pouliot (5-11, 185) of the Portland Winterhawks, Griffin Reinhart (6-3, 202) of the Edmonton Oil Kings and Morgan Rielly (5-11, 189) of the Moose Jaw Warriors. Just because left wing Scott Oke of the Memorial Cup-winning Saint John Sea Dogs didn't hear his name called at the 2011 Entry Draft last weekend it didn't mean scouts and general managers weren't paying attention. While the Sea Dogs had five of nine players among the top 124 standouts rated on NHL Central Scouting's final list of North American skaters drafted last weekend, Oke, the hard-working third-line forward wasn't one of them. Shortly after the Draft, however, Oke, the No. 44-rated North American skater, received an invitation from the Dallas Stars to attend the team's rookie camp next week. With an interesting draft weekend in the rearview mirror, here are five things that I'll be pondering on the plane ride home. 1. For the second straight year, the Hurricanes used their first pick to select a baby-faced prospect from the Kitchener Rangers. Last June, GM Jim Rutherford's crew tabbed Jeff Skinner with the seventh overall pick. That worked out pretty well, right? This time, with the 12th pick; the Canes' picked puck-moving defenseman Ryan Murphy, who had to answer about six thousand questions about his size in the run-up to the draft. For the record, he's listed at 5-foot-10, 176 pounds -- and he might just be a bit short of those measurements. Still, the scouts that I trust say his game is big ... as in really big. They just rave about his numerous offensive skills. And, they say he's not afraid of physical play. ST. PAUL -- If the 2011 NHL Entry Draft proved one thing, it's that scholastic hockey is alive and well in the Twin Cities. Minnesota high school hockey was certainly in high demand beginning Saturday at Xcel Energy Center as evidenced by the fact that 11 of 18 scholastic players were local Minnesotans. Mike Snee, the executive director of Minnesota Hockey, undoubtedly takes great pride in the type of players the state has produced over the years. "Minnesota prides itself as being the state of hockey; we have more kids playing hockey than any other kids in the country," Snee told NHL.com. "We've had a lot of success with some of our higher end players being drafted in all rounds. It's inspiring for our young players to see neighbors and kids that went through the same association as them of being drafted in the NHL." ST. PAUL -- One member of the Colorado Avalanche told NHL.com at the NHL Scouting Combine that if he had the final say at the draft table, his choices for the second and 11th picks of the 2011 Entry Draft would have been Kitchener Rangers forward Gabriel Landeskog and Saskatoon Blades defenseman Duncan Siemens. The rest of the Avalanche staff must have felt the same way, because that's how the club used its first two picks. Friday's two selections, combined with four more over the final six rounds Saturday, saw the Avalanche come away with an abundance of size -- five of their six selections are at least 6-foot tall and weigh at least 185 pounds. Topping the list is the 6-1, 204-pound Landeskog, a left wing with the Rangers who had 36 goals and 30 assists in 53 games this past season. A Stockholm native, he also served as team captain, a rarity for a European-born player in the Canadian Hockey League. ST. PAUL -- Following an historic night that saw a team-high three players selected from its roster in Friday's opening round of the NHL Entry Draft, the Saint John Sea Dogs saw two more plucked from its roster during Saturday's six rounds at the Xcel Energy Center. The Sea Dogs of the Quebec Major Junior Hockey League finished tied with the Ontario Hockey League's Oshawa Generals for having the most drafted players from the Canadian Hockey League this year. Oshawa also had five players drafted during the opening four rounds. The total fell far short of the eight taken from the Western Hockey League's Portland Winterhawks during the 2010 Draft. "My dad saw the Pens win the Cup in '92, so he wanted me to pick up a hockey stick. Who knows -- if they wouldn't have won, I may not be sitting here now." ST. PAUL -- Minnesota may be the state of hockey, but the early part of Draft Weekend had a Pittsburgh feel to it. Four players from the region -- three of whom are graduates of the same minor-hockey program -- were picked in the first 64 selections. "I think it's a validation of a long journey that Pittsburgh has taken in hockey," David Morehouse, Penguins CEO/President and a Pittsburgh native. Jonathan Miller, a center with the U.S. National Team Development Program, was taken by the New York Rangers with the 15th pick in the draft. His teammate, goaltender John Gibson, was taken 39th by the Anaheim Ducks. At No. 43, the Chicago Blackhawks selected Saginaw's Brandon Saad, and at No. 64, the Florida Panthers selected his teammate, center Vincent Trocheck. Prior to going to junior hockey, Miller, Gibson and Saad were teammates with the Pittsburgh Hornets AAA hockey team.